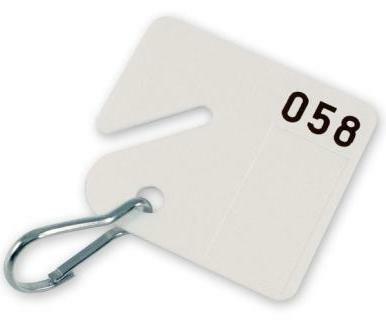 These white, 1½" square plastic numbered key tags from Luckline come with metal snap hooks that hold up to four standard size keys on each tag. The key tags fit standard slotted style key cabinets and similar key holders. These quality key cabinet tags are strung together in numerical sequence for ease of set-up; metal snap hooks are pre-attached to each tag. 20-packs up to the number 120 $6.95 pk. 100-packs up to the number 500 $34.50 pk. To order multiple packages simply select the first item, click "add to cart." Then click "continue shopping" and repeat.